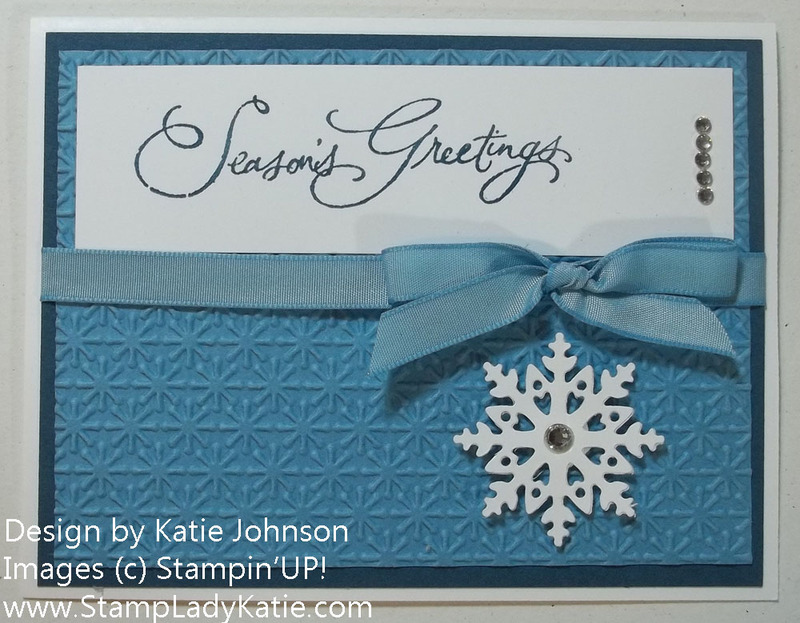 The December Stamp-a-Stack featured Flexible Cards. What I mean by that is that you could use them as Christmas cards if you wanted to, but they would not have to be Christmas cards. Its always a challenge this time of year to satisfy everyone's needs. Some people look forward to this event as a source of holiday greeting cards but others don't send Christmas cards. 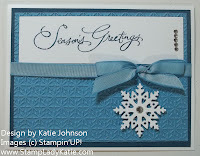 For the top card we used a Holiday Greeting from a stamp set called Many Merry Messages. As an alternative people could choose any of the sentiments from Heard from the Heart. 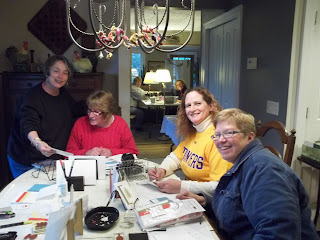 This truly is one of the wonderful things about Stampin'UP! I really appreciate being able to create 1 design and then use it for more than one card. Oh yes, you can argue that we changed the design a little. Bow and snowflake on the right or the left. The row of self Stick Rhinestones under the word or at the end of the sentiment layer. But basically its the same card. The stampers really had fun with this. They had to make so many choices this time. And it was not just choices about sentiment or left and right. These cards really encouraged people to be creative. I'll post some more of what we did later this week. Sign up NOW for an upcoming event. 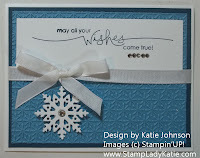 Another wonderful thing about Stampin'UP! is the relationship you have with a demonstrator. 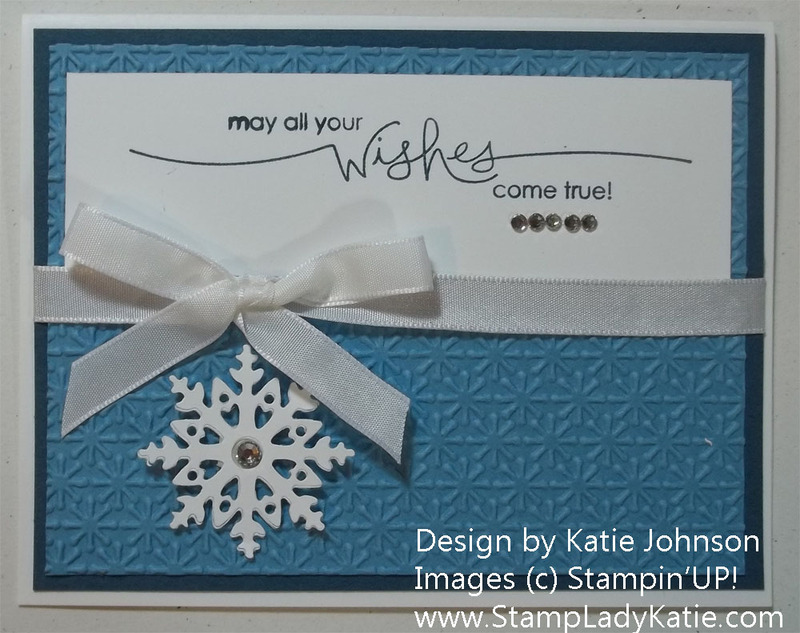 It does no good to invest in stamping supplies and then sit at home without the inspiration or expertise to use your product. Thats WHY people come to classes. And I want to be YOUR demonstrator - be sure to check my events calendar here. It's usually posted at least 3-4 months in advance. Stay informed about updated schedules. There are several other classes in the works that are not yet on the calendar. If you want to be sure you know about additions to the class schedule then SIGN UP FOR MY MAILING LIST HERE Don't miss out on the fun! Check back later this week to see more of the flexible cards we did this weekend. Here to make your stamping experience more enjoyable and more productive.